Great news from London... the 2012 Shaw + Smith Shiraz has just been announced as the 'Best Australian Red' and has been awarded 3 Trophies from the International Wine Challenge (IWC). A fantastic result - congratulations to our viticulturists and winemaking team! Another good news story for Adelaide Hills Shiraz. Cool climate Adelaide Hills Shiraz, in which balance is more important than power. 2012 was a terrific vintage with lower yields translating to great quality. Hand picked, crushed and fermented on skins in small fermenters with hand plunging and gentle pumping over to extract colour, flavour and tannin. Aged in French barriques with special care taken not to over oak the wine and maintain fruit integrity. 2012 Shaw + Smith Shiraz has the concentration and structure to develop fine tertiary characters in the bottle over the next 10 years. "I am what I eat"
Michael Hill Smith is interviewed by Tony Love, Herald Sun (Melbourne) about "I am what I eat." Due to exciting renovations at the winery, the Shaw + Smith Tasting Room will be closed for the Easter period (Friday 18th - Monday 21st April inclusive). We apologise for any inconvenience and wish everyone a fabulous Easter break. Next on Shaw + Smith’s picking list is Shiraz, and we’re excited about the slow, cool end to the season which has given rise to amazing flavour and balance at relatively low baumé levels (a measure of the amount of sugar that is concentrated in the wine). Spice and floral aromas are wafting out from our favourite S+S blocks. The Chardonnay ferment is now ticking along nicely and we are happy to see what we thought were great flavours in the vineyard showing up in the fermented batches. Savvy is also fermenting away, working its magic, and the filing the cellar with its wonderful aromas. What started as an early start to vintage, slowed down with some unseasonal rains allowing the vineyards to recover from heat. This was followed by a cool slow ripening period, keeping the grapes longer on the vines, increasing fruit intensity and flavour - always a good thing. Now we are in full swing with the cellar on 24 hour shifts. Dan, one of our vintage interns tweets "My hands are finally getting leathery, discoloured and generally manly. Thank you #v14@shawandsmith"! Challenging vintages show the extraordinary value of years of experience and knowledge. Ray Guerin (Viticulturist of the Year 2013) and winemaker, Adam Wadewitz have just come from the Woodlot vineyard, Balhannah and believe its some of the best Sauvignon Blanc flavours they have seen. Chardonnay looks like the stand out variety for the season. We are still a couple of weeks off picking the shiraz and although the yields are looking low, Ray and Adam are excited about the potential quality. Congratulations to Kathryn Hall - you won a case (6) of award-winning 2009 Aged Release Shiraz. Ray Guerin - Viticulturist of the Year 2013! 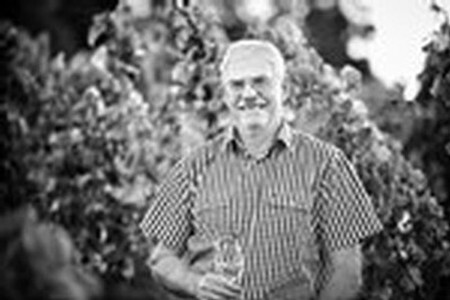 GREAT NEWS - OUR VITICULTURIST RAY GUERIN HAS BEEN ANNOUNCED VITICULTURIST OF THE YEAR! As every winemaker knows grape quality is key so best practice in the vineyard is vitally important to us at Shaw + Smith. Ray was the unanimous choice of the panel, announced last night at the 2013 Gourmet Traveller WINE Winemaker of the Year awards. Ray is as dedicated as they come and we couldn't be happier for him!